Have fun with Grandma's Christmas shortbread recipes this holiday season. Your friends and family will love eating your homemade shortbread cookies, squares, and rounds, so be sure to make lots. They also make an edible Christmas gift that's truly appreciated. Below are several of my family's old fashioned recipes for shortbreads, including a fine example of a traditional shortbread featuring diced bits of candied citron, orange peel and caraway seeds. Shortbreads such as these are traditionally served at Christmas and New Year celebrations, and on other festive occasions. Cream shortening until soft, then work in sugar. Tip sugar mixture onto flour and work in well. Press mixture into a greased pan and bake 30 minutes in a moderate oven. Cut into squares and let cool on rack. Cream butter, add sugar gradually, and cream mixture well. Mix baking soda with flour and saving 1-1/2 cups flour for board and knead as usual. Shape dough into a round, prick with fork, and bake in 250°F to 300°F oven (prefer 250°F) for about 30 minutes or less until done. Ingredients may be halved for a smaller recipe. This is the same Christmas shortbread recipe that Mom most used for her holiday baking needs. Cream 1 cup butter, beat well (or 1/2 butter and 1/2 shortening). Add 1/2 cup fruit sugar and 2 cups sifted flour, plus a few drops vanilla. Knead together well and roll out on a board. Make in rounds and prick with fork. Bake at 250° F. for about 25 minutes. Or roll out and decorate as cookies, then bake at 325° F. till done. Christmas would not be complete without another great Scottish shortbread cookie recipe. Ingredients: 1/2 cup brown or fruit sugar or icing sugar, 1 cup butter, 2 cups flour. Cream the butter, add the sugar gradually and cream together thoroughly. Add flour slowly. When a stiff dough is formed, turn out on a floured board. Gradually knead in flour till the dough begins to crack. Roll out 1/4 inch thick, cut in fancy shapes and bake in a slow oven until slightly browned. For serving at Christmas or on special occasions, Scottish shortbread cookies are nicely decorated by pressing pieces of blanched almonds, citron, peel or candied cherries in each cookie just before baking. 1 cup icing sugar, 2 cups butter, 4 cups flour. Mix well, knead until the dough begins to crack, shape into a round cake about 1/2 inch thick, crimping the edge like a pie crust. Or, roll out and cut like cookies, or prepare as you would icebox cookies. Bake on non-greased tins in a slow oven until delicately browned. Allow the shortbread to cool on the tin. Now here's a creative cookie idea you'll want to try for Christmas. 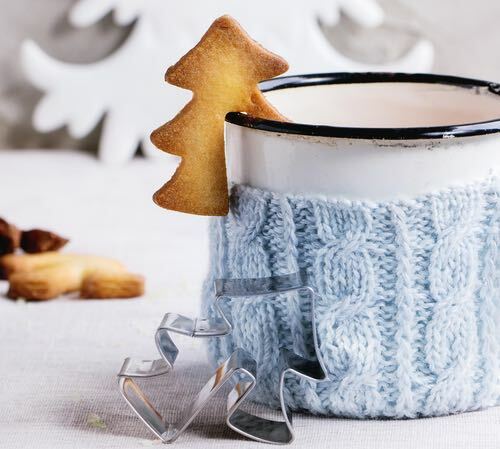 Use a special cookie cutter to make Shortbread Cookies that will rest on the rim of a coffee mug. Shortbread dunked in coffee tastes amazing at Christmas time. 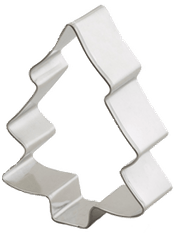 Such coffee cup cutters are not easy to find, but you can easily make your own by using pliers to carefully bend the branch of a typical metal Christmas tree cutter upwards to fashion the notch, so it fits over the mug's rim like the example given in the photo above. 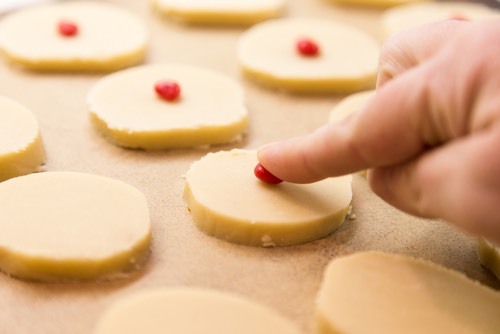 Or, cut your usual Christmas tree cookies and use a sharp knife to carefully cut suitable notches in the shortbread dough before baking them in the oven. Mix two pounds of flour, dried and well sifted, with a pound of powdered sugar, three ounces of candied citron and orange peel cut into dice, and half a pound of caraway comfits; mix these with half a pound of butter melted in a saucepan; then make the paste, roll it out the thickness of half an inch, cut it into cakes, place them on white paper, prick, and bake them of a pale color. Shortbread's history goes back to the sixteenth century and Mary, Queen of Scots. Queen Mary of Scotland enjoyed eating Petticoat Tails flavored with caraway seeds, a traditional shortbread cookie that's baked as a round shortbread and then cut into triangular shaped wedges. The wedges were called Petticoat Tails because their shape resembles the triangular fabric pieces used to make women's petticoats during the Elizabethan Era. Traditional Scottish shortbreads were also made in individual round-style cookies known as shortbread rounds, and rectangular slabs were cut into thin pieces known as shortbread fingers. Shortbread was traditionally made with fresh butter and ground oatmeal, but eventually fine flours were used. Small comfit candies and thin slices of candied orange and lemon peel were added when it was served at Christmas and New Year feasts. A sprinkle of caraway seeds was customary. Since its recipe ingredients were expensive for all but the rich, shortbread was a considered luxurious treat served mainly at Christmas, Scottish Hogmanay (New Years Eve), and on special family occasions like weddings and birthdays. Its name came into being because Scottish bakers classed short-cookies as "bread" to avoid paying the tax placed on cookies. Enjoy making delicious Christmas shortbread rounds with the authentic Scottish shortbread recipes above. Homemade shortbread makes a wonderful treat for any occasion, not just for serving at New Years and Christmas time.